I was really excited about today's theme because I finally get to use my Cheeky Jumbo Holiday plate! And there are some really cute "America" designs on the plate! I wanted to make this design all about the images so I kept my base simple, two coats of Milani White on the Spot. I added my designs using Barry M Blue Plum and Nailtiques Moscow. As much as I loved the images on their own, I felt that the design needed something extra. There was just too much white space. I decided to add some dots using the same shades. I love all the different images. It is like a 4th of July party on my nails! This mani is too cute! I love the addition of the dots to your stamping, it gives it so much extra cuteness! This is such a fun mani!! So cute! 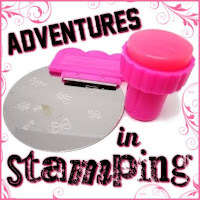 I love that stamping plate you used.